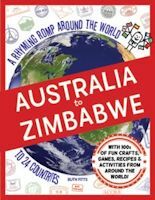 Australia to Zimbabwe: A Rhyming Romp Around the World to 24 Countries is another recent children's book project on Kickstarter. This is a large-format children's A-Z book that is a "whirlwind romp around the globe." It's an amazing labor of love by Ruth Fitts, who has a clear passion for geography and international travel and education. The book is an impressive 332 pages, covering 24 plus countries, each with ten or more profusely illustrated pages, including rhyming introductions to the culture, scads of geographic and cultural notes and photos, and fun activities including crafts, recipes, and games. The associated website provides even more, with additional activity links, music, and videos. Australia to Zimbabwe is designed for ages 8 and up. It's almost overwhelming with the amount of information, but great fun to explore and sample. It's available in hardcover for $24.95. The ZAGG Pocket is a wireless Bluetooth keyboard that folds up for travel -- or even to slide in a pocket. When folded, it's 9 x 2 1/2 x 1/2 inches, and weighs 6.8 ounces. And unfolded it's 85 percent the size of a desktop keyboard -- not so compact to crimp your typing -- and has full five rows of keys (including numeric). It folds in half lengthwise (between the "A" and "Z" rows). The design includes two additional folding elements that form a protective cover when closed, and then unfold into a stand with a flip-out holder to prop up your device. Magnets keep it closed when folded, and it automatically turns it off when closed. The ZAGG Pocket is available for around $64. It makes it much more reasonable to carry a keyboard for extensive typing on the go. The LaCie Rugged line of portable hard drives features a rugged design wrapped in an iconic orange shock-absorbing rubber sleeve. They're great for road warriors and students, providing shock and drop protection so you can throw them in a bag to bring along for additional storage. 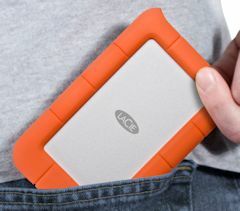 And we're not just talking a bit more storage -- the newer LaCie Rugged Mini model is available with an amazing 4 TB of storage, now down to $229, as well as 2 TB for $139, 1 TB for $99, and 500 GB for $79. With this capacity, you would need only five small external drives to hold the estimated size of the entire book collection of the Library of Congress (20 million books in 20 TB). The Mini model is 8.5 ounces, and 3.4 x 5.3 x 0.75 inches, compared to the original drive size of the LaCie Rugged Triple USB 3.0, at 9.2 ounces and 3.5 x 5.7 x 1 in. The Mini has a USB 3.0 interface, while the Triple adds two FireWire 800 ports. Both offer transfer rates up to 110 MB/s. For additional performance or security, LaCie also offers the LaCie Rugged RAID, with 4 TB for $419. You can use RAID 1 (mirrored) mode to duplicate the data across the two drives, or RAID 0 (striped) mode to double the transfer rate to 240 MB/sec, over USB 3.0 and Thunderbolt. Or if you really need the speed, the LaCie Rugged Thunderbolt (also with USB 3.0) is available with SSD storage to triple the transfer rate up to 387 MB/sec. The SSD model is available with up to 1 TB for $899. The LaCie Rugged drives are bus powered, so you don't need a separate power cable. LaCie also offers password protection software with AES 256-bit software encryption software. The LaCie Rugged Mini is particularly welcome -- It's smaller than the original size, with higher capacity and a lower price. And it provides more protection: water resistant, with shock protection for drops up to 4 feet (not while running! ), and pressure resistant up to being run over by a 1-ton car. 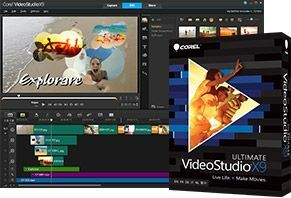 Corel has just released VideoStudio X9, easy video-editing software with impressive power for advanced users. Especially with the addition of multi-cam support, the new VideoStudio has a stunning depth of editing power even in the base "Pro" ($79) version. And this is in the base VideoStudio Pro X9 for $79.99. The full VideoStudio Ultimate X9 for $99.99 has only a few tech enhancements -- stepping up the multi-cam from 4 to 6 cameras and adding MXF (XAVC) import -- plus bundles bonus premium effect packs from ProDAD, NewBlue and Boris. Download the free 30-day trial and 300+ page User Guide to check it out for yourself. Entries posted to Manifest Tech Blog in February 2016, listed from oldest to newest.